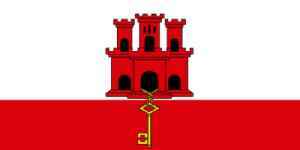 Gibraltar is a colony located at the southern tip of the Iberian Peninsula. It has an area of 6.7 km2 (2.6 sq mi) and is bordered to the north by Spain. The landscape is dominated by the Rock of Gibraltar at the foot of which is a densely populated town area, home to over 30,000 people, primarily Gibraltarians. It lacks a maritime border.